What travel story will you tell in 2019? Will it be about a culinary experience that took you by surprise? A visit to a landmark that left you eager to learn more? Or an encounter with a local resident that let you view the world from a fresh perspective? If your travel plans still aren’t set for 2019, we can help. We’ve chosen six destinations that have everyone talking—and there’s nothing quite like visiting them by sea. Discover where we can’t wait to cruise to this year, and which new travel chapters are waiting to unfold for you. Sure, Alaska has been a favorite destination of cruise travelers for years, but that doesn’t make it any less deserving of a spot on this list—especially with that we’ve got in store! An Alaska cruise with our Land and Sea Packages delivers the best of both worlds: rugged coastlines from your boutique hotel at sea, and The Last Frontier’s wild heart with an inland excursion. Explore Denali National Park, ride the iconic Wilderness Express, and discover charming towns like Fairbanks and Talkeetna. The best part? You don’t have to plan a thing. We take care of every detail along the way so you can focus on finding those authentic moments of travel inspiration. Plus, with 11 ports and immersive shore excursions like dogsledding on the Mendenhall Glacier or halibut fishing in Icy Strait Point, Alaska is the perfect place for those in need of a little outdoor adventure in 2019. Why cruise one country when you can cruise an entire continent? Each coast of Australia holds its own special wonder—and you can experience each one when you cruise with us. We’ve got 20 Australian ports on our roster, including perennial favorites Sydney, Melbourne, and stops along the Great Barrier Reef, plus a few hidden gems that showcase the country’s storied past and exciting future. Aussies have always known Perth to be a prime destination for surf and sun, and it’s now on the rest of the world’s vacation radar. It’s definitely remote, but by no means a backwater. State-of-the-art boutique wine shops are breathing new life into the country’s oldest wine region, and an emerging culinary scene is taking the bounty of produce from the Margaret River Valley to delicious new heights. South of Melbourne, the island of Tasmania contrasts Perth with its laid-back pace and lush landscapes. This was where many British convicts first arrived during Australia’s days a penal colony, with historic sites all over the island. Looking beyond its somber history, Hobart is home to an eclectic arts scene, unique shopping at Salamanca Place, and eco-tourism adventures on nearby Bruny Island. Future-forward and at the same time focused on tradition, Japan is just the place to immerse yourself in rich culture, sweeping landscapes, and tantalizing cuisine in 2019. Hosting the Rugby World Cup this year and the Summer Olympics in 2020, the entire country is gearing up to welcome the world. Don’t worry about making your way through massive crowds, our Japan-Intensive voyages take place before all the action begins. These cruises give you more time in port, and visit up to 12 destinations for a once-in-a-lifetime experience you won’t find on other cruise lines. Discover quirky attractions like Kitakyshu’s Toto Toilet Museum, savor impossibly fresh sushi in Sakaiminato, and experience the samurai way of life in Akita. The very best time to see Japan is in the spring, when beautiful, delicate cherry blossoms are in bloom—and it just so happens we have two Japan-Intensive cruises to choose from in April! Brazil has always taken our breath away. 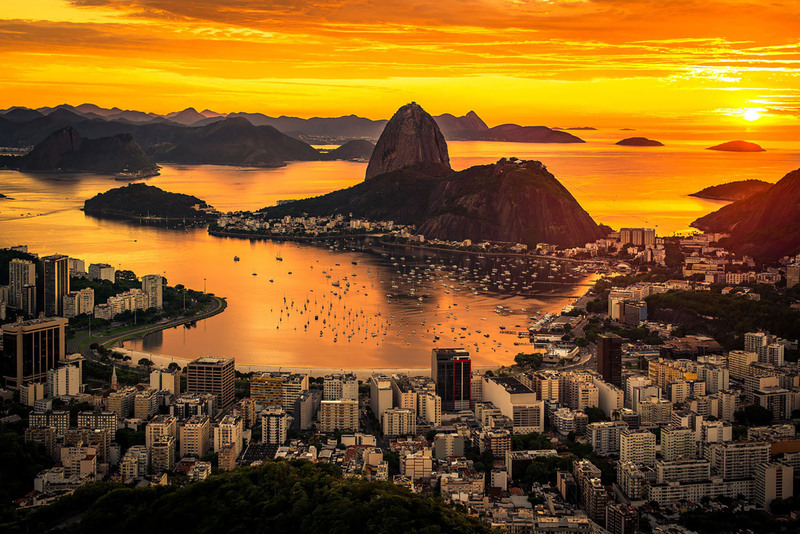 The electric energy of Rio, the lush tropical rainforests full of diverse wildlife, and (we can’t stress this enough) the cuisine—there’s just so much to love! Indigenous tradition, Portuguese passion and African rhythm influence almost every aspect of Brazilian life, from food and music to dance and even martial arts. A cruise is the best way to explore the country’s hidden gems. It’s the fifth largest country in the world, so destinations are quite spread out. If music moves you, Salvador is a must-visit. Located in Brazil’s northeastern state of Bahia, it’s the birthplace of music genres including samba, bossa nova, and tropicália, and was designated a designated a UNESCO City of Music in 2016. Take a percussion workshop on one of our immersive shore excursions and learn what it’s like to march to the beat of a different drum at a local community center. Want to ring in 2020 in style? Watch the clock strike midnight aboard Azamara PursuitSM in Rio, then make your way Copacabana Beach to revel with the locals on our 15-Night New Year’s Eve in Rio voyage. If your travel style leans toward sand and sun seeking, but your companion is captivated by history, Croatia is the 2019 destination for you both! Medieval walled cities with maze-like streets, national parks with crashing waterfalls, and seaside resort towns that echo the Italian Riviera make this Adriatic nation one that you’ll want to keep coming back to. In Split, Diocletian’s palace dates back to the 4th century, but it’s far from an ancient relic. You’ll find trendy cafes, restaurants and shops tucked next to impressive churches and Gothic palaces. If you’re in the mood to see and be seen, the white-marble Riva promenade is the place to be. The island of Korcula is said to be the birthplace of Marco Polo, an explorer after our own hearts. Here, rare wines from the hills of Lumbarda pair perfectly with artisanal cheeses and salted fish salad. Make your own picnic basket and head to Racisce Beach with its smooth white pebbles, clear turquoise waters, and maritime charm. What makes Croatia so compelling is its people. They’re fiercely proud, incredibly friendly, and more than happy to share their country and their culture. Is an exotic escape at the top of your travel list this year? You’ll find it in the Philippines. More islands than you can count rise straight out of aquamarine waters, providing endless opportunities for exploration—and plenty of beaches to sit back and watch the world go by. Filipino culture is as inviting as it is intriguing, with a strong focus on family and hospitality that instantly makes you feel at home. In 2019 we’re sailing to two new Philippine ports: Coron and Boracay Island. In Coron, swim, snorkel, and scuba your way around remote islands and twisting mangrove forests, and discover sunken WWII ships that are now home to brilliant coral. With powder-fine beaches shaded by tamarind trees, and local bars serving cold drinks and barbeque, this is one of those places where time truly stands still. The Philippines is one of the world’s most bio-diverse countries, and Boracay Island is a great place to experience local flora and fauna. Bakhawan Eco-Park is the perfect outdoor adventure to take in by trail, kayak, or bamboo raft. Visit both of these idyllic ports, plus the metropolis of Manila on our 12-Night Philippines & China voyage. These destinations are sure to leave you speechless. Then, the story is yours to tell. 2019 with Azamara brings even more unparalleled destinations and immersive cultures—when will we be seeing you on board? Browse all of our 2019 voyages here.